The readout end of two Cosmic Ray Veto scintillation counters. 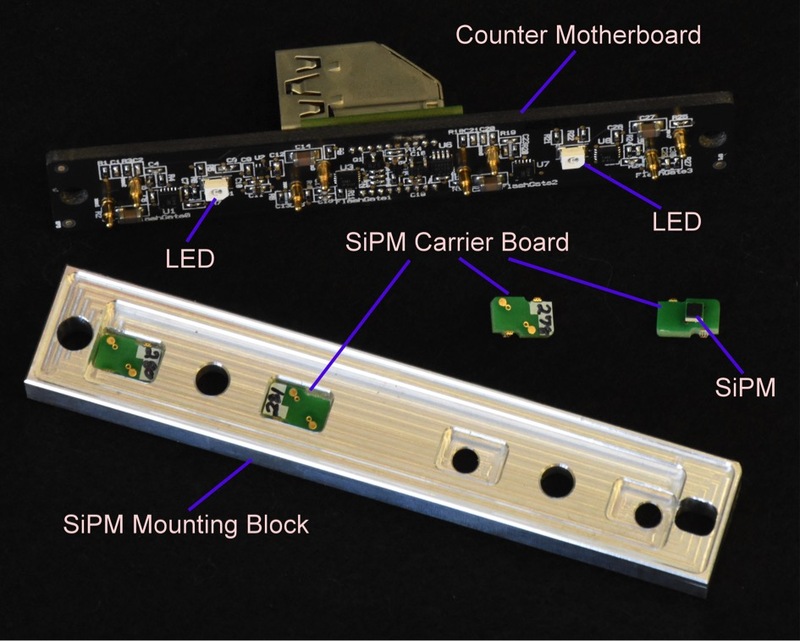 The silicon photomultipliers used to detect the light from the wavelength-shifting fibers are soldered to small carrier boards that sit in wells milled out of the aluminum mounting block. The readout board, designed at Fermilab by Sten Hansen and Paul Rubinov, is electrically connected to the carrier boards by spring-loaded pins. It sends the silicon photomultiplier signals to another board (not shown), which amplifies, shapes and digitizes the signals. Two flasher LEDs are used for calibration. Cosmic rays can be a real pain. These high-energy particles, mostly protons, rain down upon Earth from the sun and the galaxy. Fortunately, for those of us living on Earth’s surface (that is, pretty much all of us), the thin wisp of the atmosphere that covers Earth is a pretty good shield, and only a trickle of the cosmic-ray radiation reaches us. Earth’s magnetic field helps too, deflecting away most of the charged particles coming from the sun. But if you are an astronaut you must take care, particularly for long-duration missions. The radiation dose for a year-and-a-half mission to Mars would be over 1,000 times what you receive on Earth from cosmic rays. That is 65 times the annual limit established by Fermilab. Your electronics would also take a pounding and must be specially designed to withstand the onslaught. Cosmic rays are not a health hazard on Earth’s surface, but for particle experiments they can produce backgrounds to your signals. These can vary from being merely annoying to actually limiting your sensitivity. Cosmic rays can be a real pain. Experiments in the intensity frontier — neutrino experiments, dark matter searches and rare decay search experiments — have to defeat these backgrounds. Dark matter experiments usually do so by placing their apparatus deep underground, often in abandoned mines, where few cosmic rays or their products can reach them. Long-baseline neutrino experiments are also typically deep underground. NOvA at Fermilab is unique, with its far detector on the Earth’s surface. More than 100,000 cosmic-ray muons each second course through the NOvA far detector up in northern Minnesota, while the neutrino events of interest coming from Fermilab are orders of magnitude rarer. NOvA deals with this background by employing a detector with excellent timing and direction resolution: The far detector knows when the neutrinos should arrive and from what direction, and hence cosmic-ray muons are easily removed in the analysis. Mu2e is searching for an exquisitely rare process: the direct conversion of a muon into an electron with a proposed sensitivity of 3 x 10-17. As with NOvA, cosmic rays are a pain for Mu2e. A big pain. On average, cosmic-ray muons will produce one event a day in the Mu2e detector that cannot be distinguished from the signal. In order to keep that rate at a negligible level it must be reduced by a factor of 10,000. The apparatus would have to be placed more than a kilometer underground to do this, which is simply not feasible. Hence we have surrounded the apparatus with a detector, the Cosmic Ray Veto, that identifies these muons. Any signal-like event that coincides with a muon identified in the Cosmic Ray Veto is thrown out. The Cosmic Ray Veto must have a 99.99 percent efficiency over an area roughly that of a typical large home in the United States. This isn’t easy! Gaps, even small ones, that the cosmic-ray muons can sneak through can be a problem. Electronics must be completely reliable. Members of Cosmic Ray VetoGgroup at the Fermilab Meson Test Beam Facility hold a Cosmic Ray Veto counter. Top row, from left: Enhao Song (U. Virginia), Alexander Simonenko (JINR, Dubna), Ralf Ehrlich (U. Virginia), Yuri Oksuzian (U. Virginia), Yuri Davydov (JINR, Dubna), Martin Frank (U. Virginia), Steve Magill (Argonne). 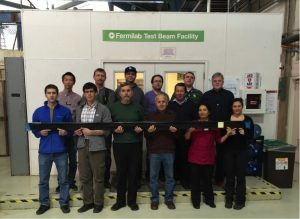 Bottom row: Vladimir Baranov (JINR, Dubna), Serdar Kurbanov (U. Virginia), Sten Hansen (Fermilab), Akram Artikov (JINR, Dubna), Shruti Shrestha (Kansas State University), Cristiana Principato (U. Virginia). Making things even more difficult is the environment that the Cosmic Ray Veto operates in. To meet Mu2e’s sensitivity goals, an intense muon beam is needed — one of the most intense in the world. Along with the muons come other particles: neutrons and gammas in particular, and they can get to the Cosmic Ray Veto, causing backgrounds that can look like cosmic-ray muons. So the Cosmic Ray Veto is shielded from these by huge concrete blocks that surround the Mu2e apparatus. The Cosmic Ray Veto consists of four layers of long, thin scintillator counters, each with two embedded wavelength-shifting fibers. Tiny four-square-millimeter silicon photomultipliers turn the light spiraling down the fiber into electrical signals, which are amplified, digitized and time-stamped by custom electronics designed by Fermilab. Each layer must have an efficiency of at least 99.5 percent. To achieve that efficiency, the counters need to produce a lot of light, or photoelectrons, in the photodetectors. 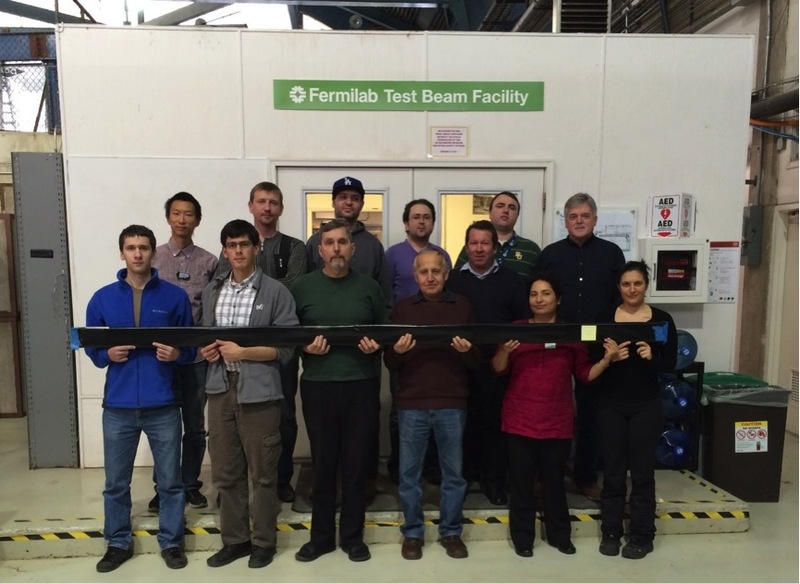 To measure the all-important photoelectron yield, the Cosmic Ray Veto Group has mounted an R&D campaign at the Fermilab Meson Test Beam Facility. Initial results were disappointing: The photoelectron yield was small. The Cosmic Ray Veto Group went back to the drawing board, improved the counter design, improved the light output of the scintillator (produced at the Fermilab NICADD facility), and employed a new, improved photodetector. The hard work paid off: Results from two test-beam runs in March and June of 2016 were spectacular and showed that the new counters meet the crucial photoelectron requirement with a safety factor of over 1.5. With this good news in hand, the Cosmic Ray Veto Group passed the Mu2e DOE CD-3 review with aplomb this past June, the last major review before construction begins. There is still much work to be done before production of all of the components of the Cosmic Ray Veto commences in the fall of 2017. And everyone looks forward to the day early in the next decade when Mu2e starts taking data. When that day comes, the Cosmic Ray Veto will be in place identifying and rejecting those nasty cosmic rays. Cosmic rays are a real pain. E. Craig Dukes is a professor at the University of Virginia. The Cosmic Ray Veto Group includes physicists and engineers from Argonne National Laboratory; Brookhaven National Laboratory; Fermilab; Institute for High Energy Physics, Protvino; Joint Institute for Nuclear Research, Dubna; Kansas State University; Northern Illinois University; University of South Alabama; and the University of Virginia.